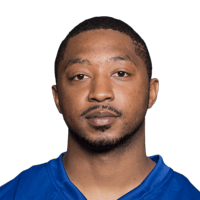 Published: Nov. 15, 2015 at 07:25 p.m.
Giants Trumaine McBride intercepts Patriots Tom Brady at the goal line. Published: Nov. 1, 2015 at 04:48 p.m.
Giants Dominique Rodger-Cromartie forces the fumble and Trumaine McBride brings it in for a touchdown. Published: Sept. 13, 2015 at 11:08 p.m.
Trumaine McBride makes a nice interception against Tony Romo and the Dallas Cowboys. Can't-Miss Play: Rodgers-Cromartie scoops and scores! Published: Sept. 13, 2015 at 09:54 p.m.
Dominique Rodgers-Cromartie recovers a Cole Beasley fumble for a touchdown to put the New York Giants ahead of the Dallas Cowboys on "Sunday Night Football."